The story of Andy Harrison, a man battling with the death of his childhood sweetheart - a death for which he blames himself. When a light plane is lost on the top of a foggy mountain, Andy must battle the dangers of the mountain and the same flooding river that claimed the life of his one true love - in order to save those who are lost. A story of loss and forgiveness, love and adventure, and with several brilliant, hidden twists - brilliant reading! Andy Harrison is a good man, but he has a troubled heart and a troubled past. At the tender age of sixteen Andy and his sweetheart, Rosalind Stedman, had what most could only dream of - true love. But in a sad and tragic twist, Rosalind is carried away in the swollen Choppy River. Andy bravely dives into the flooding torrent in an effort to save the girl of his dreams, but he fails, almost losing his own life. After striking a hidden boulder within the rushing water, Andy hits his head hard, and can no longer recall any of the events on the mountain that day. He is left to suffer, blaming himself for Rosalind's death, still deeply tormented after twenty long years. Andy has little memory of the horrific events of that most tragic of days, and bears the guilt and torment of lost love. He also bears the scorn of Rosalind's brokenhearted father - the town's chief of police. Only his best friend, Natalie, seems to understand him. Natalie is like an angel to Andy, always encouraging him, never condemning. But to Andy's torment, he can never marry Natalie, since she has a secret past too, which only he knows. Then there is Sarah, Andy's friend since school days. Sarah loves Andy, but he can never move beyond friendship with her. Sarah loves Andy, and Andy loves Natalie, and none can find lasting happiness or peace. When a light plane is lost on the top of the foggy mountain near their town, Andy sets out to save the survivors. Foremost in his mind is the fact that a young girl is listed among those on board the missing aircraft. Twenty years of pain and torment can not allow him to wait, knowing that the girl is lost on the mountain. Andy risks his life to save those lost on the mountain, the Choppy River always intent on claiming what it failed to do twenty years earlier. Andy must face his past, his pain, and the terrors of the river and the mountain that took Rosalind's life. As he dares to face all, memories of that tragic day twenty years earlier slowly begin to surface in his mind again... and hidden truths are revealed. Andy must battle the dangers of the mountain and the same flooding river that claimed the life of his one true love - in order to save those who are lost. And all the while he must confront his disappointment and anger with God over all that he has lost and suffered. By success or by death, one way or another Andy knows that his perilous journey will finally bring him peace. This is a story of deepest love, loss and adventure, and with several stunning, hidden twists - simply brilliant reading! You will cry, and you will celebrate victories as you read. 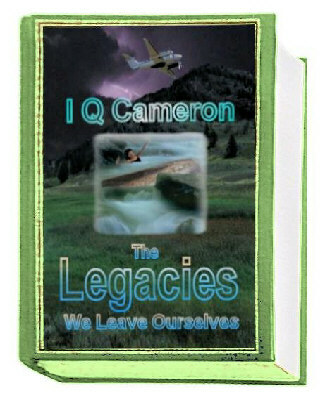 But for certain, you will never be the same after reading 'The Legacies We Leave Ourselves'. This is a beautiful, moving story. But instead of the familiar click she expected as the seatbelt was fastened, it made the loudest sound she had ever heard. Marie’s whole world exploded, and she felt great pain as she was thrown about in her seat, straining against the restraint she had just fastened. Marie lost sight of Stephanie in another second, not because the girl was not still there, but because they were being tossed about with such brutal force. There came the sound of shattering glass and the horrifying roar of scraping metal. Almost instantly came another bright flash, and then the smack of debris hurtling about the darkened cabin. And all this amid the loudest, snarling crashing sounds she had ever heard. And then Marie’s world became black and silent. "There's a kid on board, Andy. A twelve year old girl." Sarah's voice crackled to life inside Andy's reeling mind, and was then echoed a moment later by something Natalie had said just before they parted. "It's not your fault, Andy. Don't hate yourself. Just let it go. You can do more good alive today, than dying every day, living in the past." He could still see her saying the words. It took a moment to realize. Jonesy’s boat was in the water – the raging water, with a snaking rope tail following mutely after it. The boat had slipped quickly and silently down the timber slipway into the torrent. And Andy’s one true love had been drawn in with it. Andy could feel his heart pumping, not with love now, but with awful, dreadful fear. That scream had echoed in Andy’s mind for twenty years. With his face twisted in pain by the rising, forgotten memories of detail, and with tears streaming down his sweating face, Andy suddenly heard the splintering sounds again. His mind snapped to attention, just in time to realize that it was not the sounds of Jonesy's boat splintering that he was hearing, but that of the bridge. Beneath Andy's feet, after the best part of a century's service, the rope-bridge finally failed. A relationship with God? Was that even possible? Wasn’t He just the intergalactic policeman who punished them when they did wrong? Wasn’t He just the impassive onlooker who poked pins into them to remind them of how they had failed in life? Andy certainly didn’t think so. Not anymore. Jesus had changed him from the inside out. Jesus was real. A person. He was God and a person! Someone Andy most certainly had a relationship with. Andy pounced upon the creature, which he knew deep down had caused him all his pain so many years ago... He was quite out of his mind, his heart pounding in his chest as a shrill grunt burst forth from deep inside him when the two made contact. This was it, Andy! This was it twenty years ago! Remember now, Andy? Remember now? Grab it, Andy! Wrestle it this time and subdue it! Don't let it escape your grasp this time. Don't let it go now! Remember now, Andy? It hurt, didn't it? Remember how it hurt, Andy? You missed the beast last time. Remember that? You weren't quick enough, were you? Remember how that felt, Andy? You were too slow, and the thing cost you the love of your life! Didn't it, Andy? Didn't it! ...this time there were two monsters, not just one. Twice the battle. Little wonder he had not been able to save her! The monsters were so strong. Strong, aren't they, Andy? Remember now, Andy? Remember the monster now, Andy? Remember me? This is what destroyed you so long ago. Remember now? Another terrifying screech heralded the arrival of the second beast from the fog. It slid into view, speeding past on his right just like the other had tried to do. This one will kill you if it gets you, Andy! It'll kill you if it can! Remember now, Andy? And while he did not recognize the beast at first, he remembered it as if from a terrible, deep nightmare... It was cruel and awful, tearing him to the very depths of his mind and soul. This was the thing that had caused him so much pain. Yes, I remember it now! I finally remember it! I remember! But it will have to kill me to escape this time. It will not take another life, except through me! I remember now. I remember! Yes, I remember it all! ...he blinked as he tried to focus on the thing. It writhed beneath him, snorting. This was the thing that killed her, Andy. Remember it now? Andy cried aloud with shock, his body shaking violently. He surrendered, unwilling and unable to fight anymore, his mind traumatized and in deep shock. As the dirty face rose from the mud beside him, its soft brown eyes studying him all the while, Andy saw the face and knew it well. Instead of the face of a beast rising from the mud, it was the face of Rosalind Stedman. ...Two rotors were shattered, flinging lethal pieces away from the stricken bird in an instant. The projectile that had caused the fatal wound was then itself smacked hard like a ball on bat, its trajectory changing so that it thumped down hard on the top of the pilot's cabin. Sarah Emerson watched from the riverbank, her mouth wide open in a wrenching scream as for the second time in her life, Andy Harrison was washed away in the murky, flooding water of the cruel Choppy River. Finally, as though in one last desperate effort to smash him, the river struck out with one more hidden monster, a mossy boulder that smashed his left temple as he spun in the water, gouging his ear and scalp... Andy felt terror as consciousness began to evade him, but he was unable to fend off the cold, inky blackness that enveloped him. But he could not fight it. Darkness gathered, crushing the tiny lights he had seen. Then came silence. His last conscious thought was of horrifying sorrow, as he realized his arm no longer held the young girl he had fought so valiantly to save. She was gone, beyond his touch. His body surrendered to the cold, dark blackness that had striven for so long to claim him. Purchase the incredibly uplifting conclusion to The Legacies We Leave Ourselves.